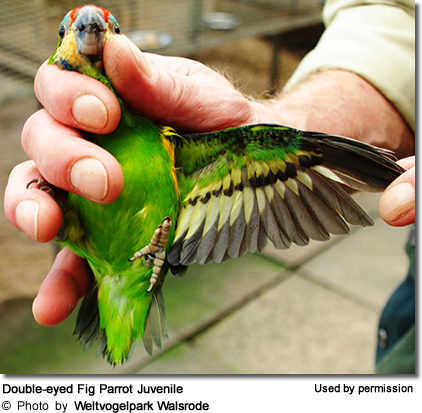 English: Breeding Fig-Parrots in Weltvogel Park Walsrode: With Calmness to Success! German: Zucht von Zwergpapageien im Weltvogelpark Walsrode: Mit Ruhe zum Erfolg! 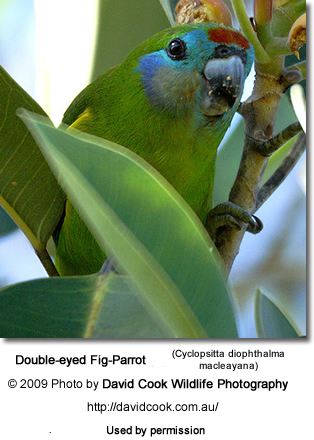 The Double-eyed Fig Parrots, Cyclopsitta diophthalma, are also known as Two-eyed Fig Parrots, Blue-faced or Red-faced Fig Parrots, Dwarf Fig Parrots and Lorilets. They inhabit primarily the island of New Guinea, but isolated populations are also found along the tropical Australian coast, east of the Great Dividing Range. They are difficult birds to observe in their habitat because of their small size, camouflaging plumage and rapid movement in a forest or near-forest situation. They are also usually high up in the canopy and on the edge of the foliage. 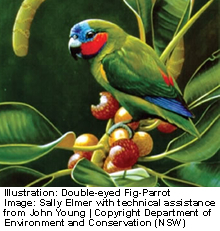 Fig-parrots feed primarily on the seeds of figs, which explains the common name. The name "double-eyed" was derived from the red patches above and below the eyes, resembling another set of eyes. 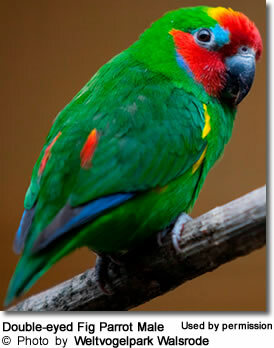 There are eight described subspecies of the Double-Eyed Fig-parrot. 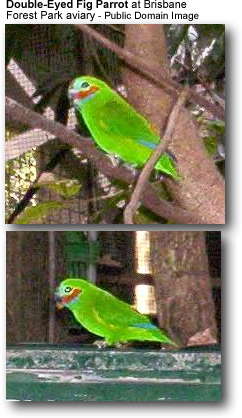 Five subspecies of Double-eyed Fig-Parrot are known from New Guinea and the West Papuan Islands. 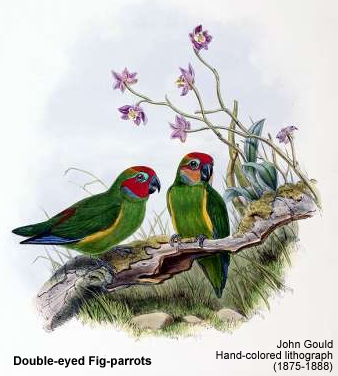 While the Marshall's and Red-browed Double-eyed Fig Parrots are relatively common in their natural habitat, the Coxen's is either extinct or close to extinction. A few unconfirmed sightings of the Coxen's have been reported, but some experts believe that this fig parrot may indeed be extinct in its natural environment. 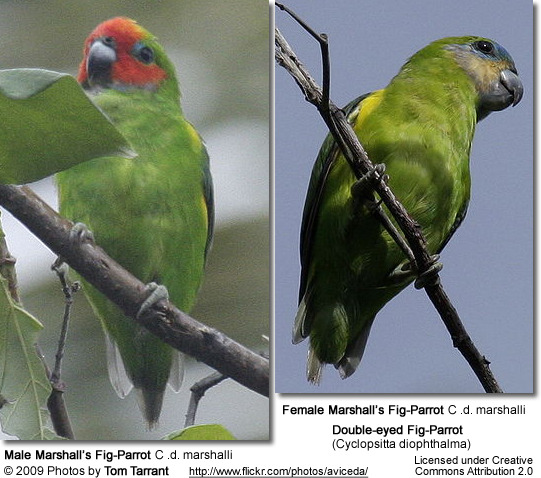 Double-eyed Fig-parrots have been declared rare in the Wet Tropics region. These energetic and attractive parrots are infrequently found in aviculture, although their popularity and availability is increasing. 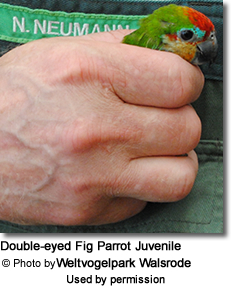 Captive double-eyed fig parrots are more common in Europe than in the United States. 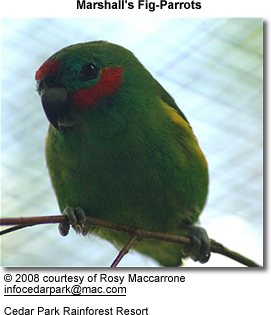 The Double-eyed Fig Parrot is Australia's smallest parrot averaging 5 1/2 in (13-15 cm) in length. They have short tails, and the head and bill appear disproportionately large. The plumage of these fig-parrots is predominantly green-yellowish with colorful facial patterns consisting of distinctive red and blue markings and a prominent blue forehead in the adult birds. The wings are blue-edged and are particularly noticeable in flight. At rest there are two obvious red spots on the back. 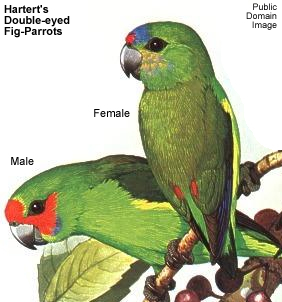 The Double-Eyed Fig-Parrot is sexually dimorphic, with males having a much brighter plumage than females. Both sexes have a red forehead, but the males also have a red cheek patch, while the females' tends to be yellow. 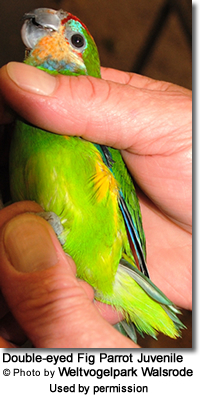 They can be distinguished from small lorikeets by their short tail and lack of under-wing color. Unlike many other parrots which generally use existing holes in trees for nests, Double-Eyed Fig-Parrots excavate their own nest cavities by boring a hole into a dead rotten tree to make it a suitable nesting site for raising chicks. Authenticated reports regularly record two eggs as an average clutch size. For the most part, captive breeding results have been very poor to date. The reason for this appears to be the diet. In recent years, more information on this topic has come to light and breeding successes have significantly increased. Fig-parrots generally feed on figs, berries, seeds, nectar, insects and larvae. They also feed on the kernels of many tiny seeds, including those of figs, buttonwood and ironwood. Foraging is done in pairs or in a flock of only a few individuals. 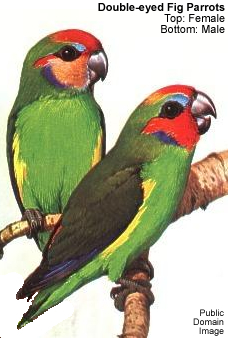 These fig-parrots produce short and shrill two or three note zzzt-zzzt or zeet-zeet calls. These calls are usually made in flight, but occasionally they utter them when perched. While feeding, they may also make a variety of softer, chattering noises. For the most part, however, they tend to be quiet once they have finished feeding. Description: The male has some pale red in the face and a soft purple color under the ear.